This entry was posted in Humor, Imagination, Nature, photography, Poetry and tagged Christmas. Bookmark the permalink. Absolutely fascinating. It is nice to realise that not everything ultimately dies! there is always scope for rejuvenation!! greetings from India to you! Aha! Appearing, disappearing, reappearing…life always changing forms. Like a magic trick that’s hard to understand. Yesterday, I saw the movie “Life of Pi”….about the adventures of a young boy from India. I absolutely loved it. Greetings from the U.S. to you also! Your little review makes me all the more interested! btw…can we also call this post “Rudolph”!! 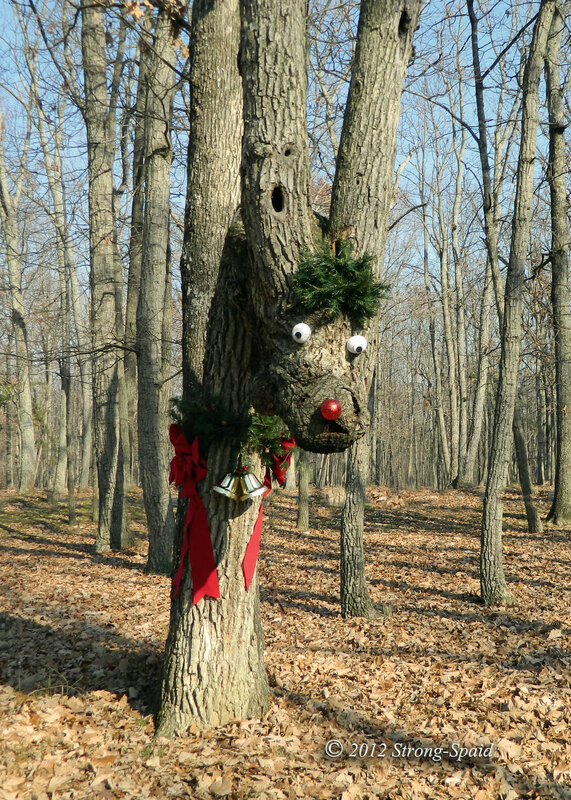 And yes, I guess you could call it a rooted Rudolph. Once you mentioned Rudolph, my mind started singing to itself. It is really cute .. but it will be kinda scary at nite if it have glowing eyes and a flashing red nose. LOL!! Luckily, it has no power source…so no blinking, no flashing. If might glow in the moonlight though. And that might be rather unnerving. It’s totally brilliant, I had to share this with friends… LOL! Words like that make tree reindeers happy! Well, its so rare to meet one, what else can you say? Truly Awesome Creation………….the picture and the lines following it. The tree is quite visible to those who pass by. That’s how it caught my wandering eyes. Oh my GOSH! Adorable! LOL! How very, very cute. What fun … thank you so much for sharing! It is a cute little face, I agree. With ribbons and bows and ZING! Thanks….Happy Holidays to you also! Wanted to wish you a Merry Christmas and a Happy New Year and to give you a star for your BLOG! Thanks Eunice. I love trees also. Great to see this little one so thoughtfully ecorated. And now, with a star on top of it all. Merry Christmas! This looks to me like the head of a friendly dragon. I also seem to see a face with an elliptical mouth in the trunk above the would-be animal’s head. I see that little face too. Must be Santa? Thanks….I hope it made your son smile! He couldn’t help but laugh. He is 14 and has that same type of sense of humour. My grandson came up with the idea for the short story “Revolt of the Green world” that I posted back in November. Young minds are such a great source of creative inspiration—because they are usually not afraid to think outside of the box. Aha! I live about 15 minutes away. I work from time to time within your subdivision, for the Visiting Angels. All of the photos in my post “Honking Attitude” were also taken there. And “Dreaming Eyes” ….that is a negative inversion of a tree that is very close to where I photographed the geese. I am also singing with the Rappahannock Chorale Society (RCS) and we are learning Civil War songs for a concert in the Spring. There are several people in that group from your subdivision. Small, small world it is! Steve….I guess you have seen? It is August (2013) now, and I saw one of the tree reindeer antlers on the ground when I drove past the tree last week. I am so glad I got a photo last Christmas!